It's always such a pleasure to visit home, which is Pittsburgh, Pennsylvania for us. Last year, we couldn't travel home for the holidays because I was nine months pregnant with Rosie Ru. This year, the idea of driving 12+ hours with an infant in the car is less than appealing. We made the drive in August, so it hasn't been put in our too-distant memory as of yet. AND the traffic! We once spent an additional four hours in the car on I-95 during a Thanksgiving weekend in 2013. A big NO THANK YOU to that, plus having a baby in the car. While we were home in August, we visited one of my favorite stops in Pittsburgh, Prantl's Bakery. (If you haven't heard the buzz or tried their cake, they make the best cake in America, their Burnt Almond Torte. And it's quite amazing.) When I went back recently, they started making Burnt Almond Torte Cookies. So genius -- why didn't I think of that?! I had forgotten about the cookies for a few months, but as Christmas crept closer, I thought, "Why not add these to the cookie making list?" My parents are coming down to visit for Christmas, so I've decided to make half a batch of cookies every week and put them in the freezer, so we have good variety when they arrive! I started doing this the first week of November! I highly recommend it, although you may run out of freezer space! These cookies are thick, just like you would see at a bakery. 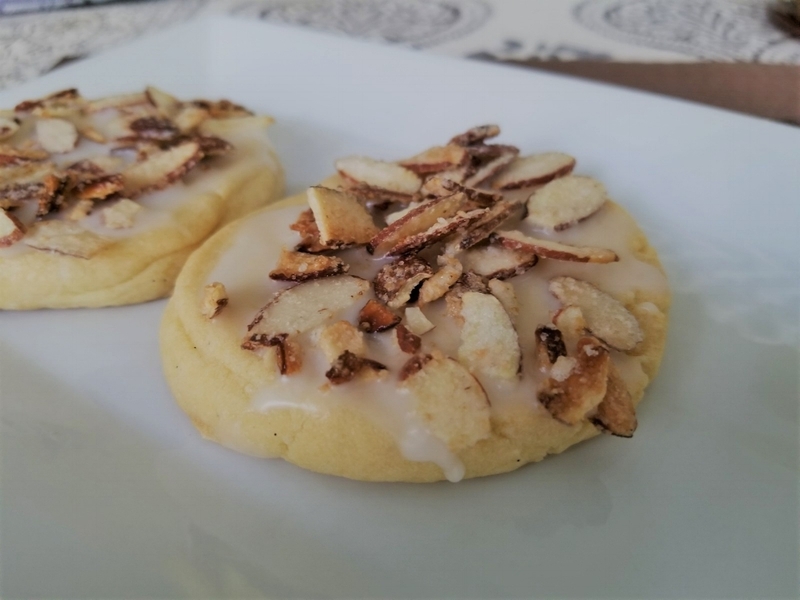 The glaze and almonds put them over the top! If you need a unique, show-stopping cookie this holiday season, I highly recommend these ones -- and maybe my Cardamom Crinkle Cookies. 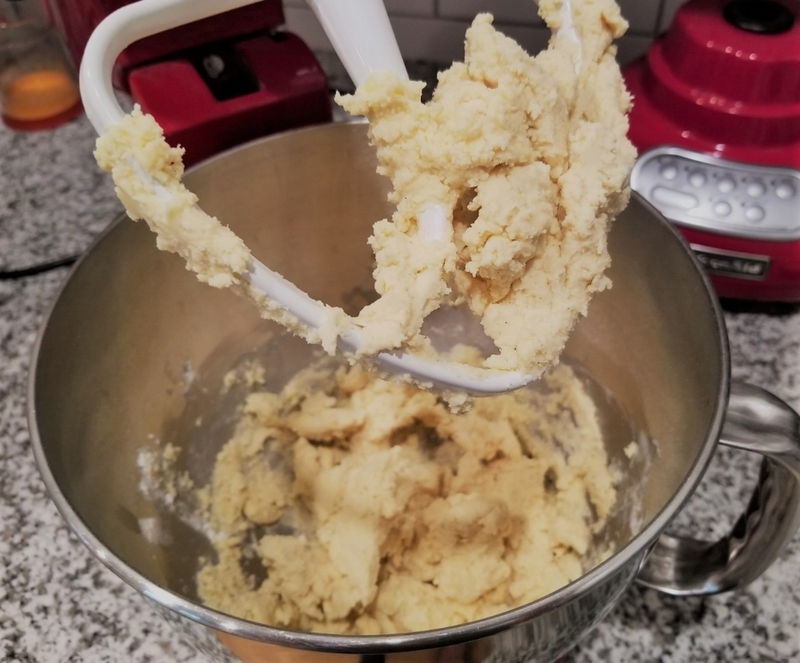 In a medium-sized bowl, combine the dry ingredients: flour, cornstarch, and tartar. Set aside. 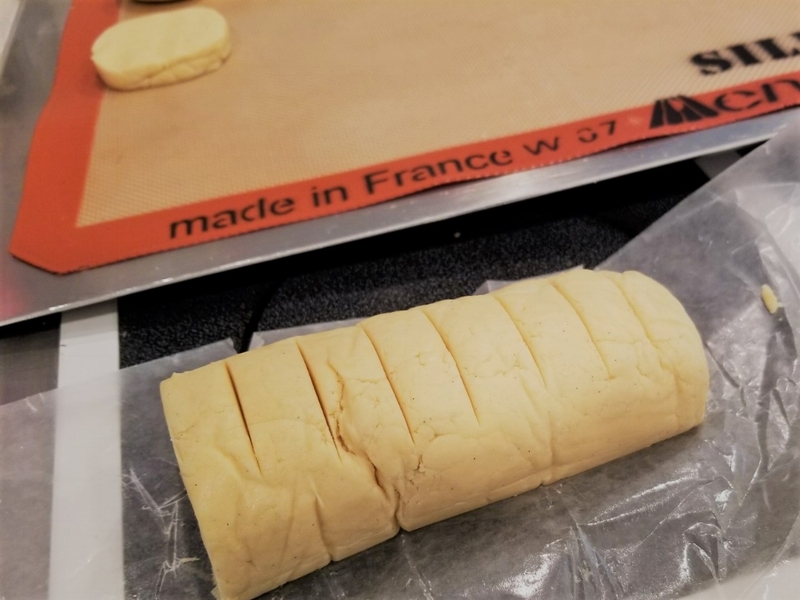 Grab some wax or parchment paper -- spoon the dough in and roll it into a cylinder. Think of those slice and bake cookies. Once they are the size you want, score the dough every 1/2 inch or so. This recipe should yield close to 24 cookies, depending on your cookie size. Slice the cookies and place them on parchment or a Silpat. Press them down into a flatter, more circular shape. Slide the cookie sheets into the fridge for 30 minutes. When you're ready, heat the oven to 350 degrees Fahrenheit. Bake the cookies for 15-18 minutes, or when the tops start to turn a golden color. Allow them to cool completely on the sheets. This is the easy part! For the nut topping, please follow the directions here, on my original recipe. You can make these days ahead of time and keep them in a sealed container. As for the icing, simply combine a cup of powdered sugar with a 1/2 tsp. of almond extract. Add in water, a tablespoon at a time, until the mixture resembles Elmer's Glue. Slather each cookie in icing and sprinkle the candied nuts on top. These cookies look so much like the ones in Prantl's display case -- I bet you could even fool your friends. Enjoy these tasty, vegan cookies!